X is for X-ray Fish! Ah yes.. that tricky X in the Animal Alphabet!! In fact.. the letter X is always a tricky one when crafting an alphabet with kids. But hooray for the X-ray fish. 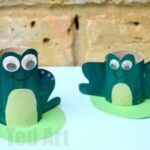 And yes.. in order to try and complete our Toilet Paper Roll Animal Alphabet, we bring you this super cute and fun Toilet Paper Roll X-Ray fish craft. 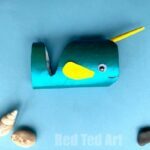 We haven’t made toilet paper roll fish before, but you may like our Toilet Paper Roll Narhwal and The Craft Train has some great Toilet Paper Roll fish too (a bit more colourful than our X-ray fish – my son (10) asked *cough* why we needed to make a dead fish.. good question.. teehee). 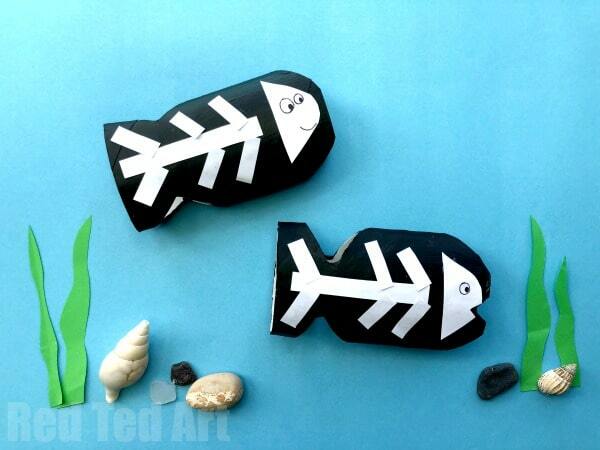 This craft is based on a Handprint X-Ray Fish that we made many moons ago! 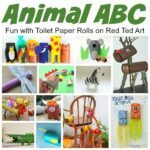 I am sure you will agree that this is a super quick adn easy Toilet Paper Roll Animal craft for Preschool! 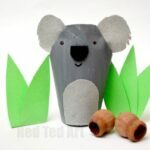 And makes a great addition to the Animal Alphabet we have been working on! 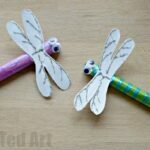 Begin by “flattening” your toilet paper roll and drawing a fish outline. Make sure that the back of the fin is not too pointy as you will cut the Toilet Paper roll open by accident if you do (mine in the image above did jsut that! 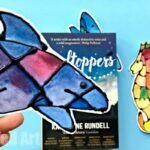 And though the craft wasn’t ruined, it would have been better to have the top of the x-ray fish’s fin connected!). 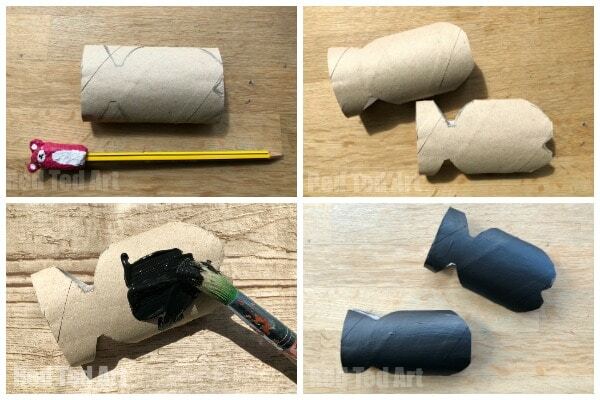 Paint the toilet paper roll black and let dry! 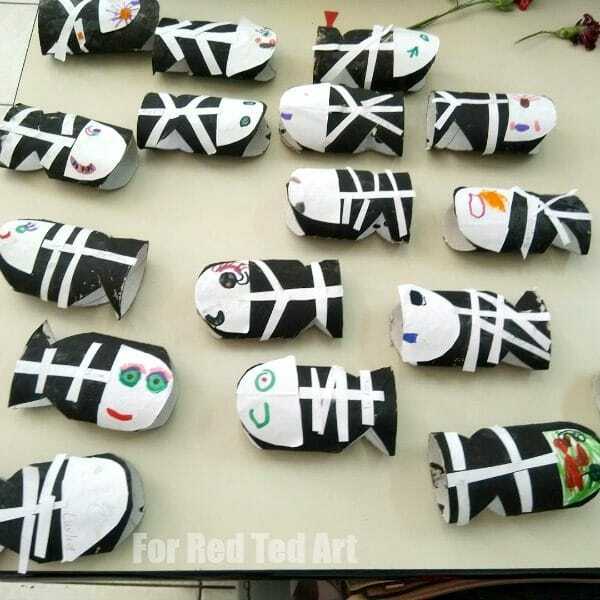 Cut some strips of white paper – we cut one long one that fits the length of our toilet paper roll and 6 smaller strips plus a “face”. You can draw on a face to your fish or use googley yes. 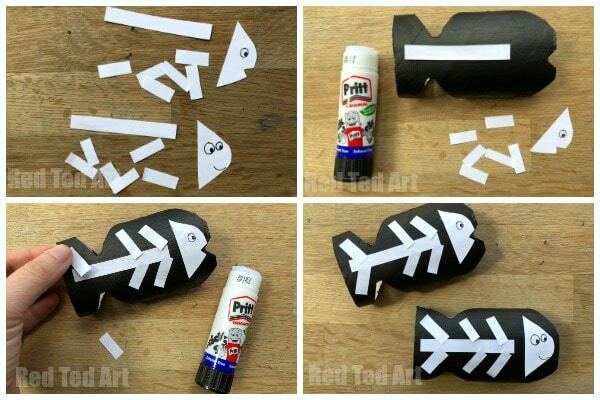 Glue you X-ray fish’s skeleton on with a glue stick. 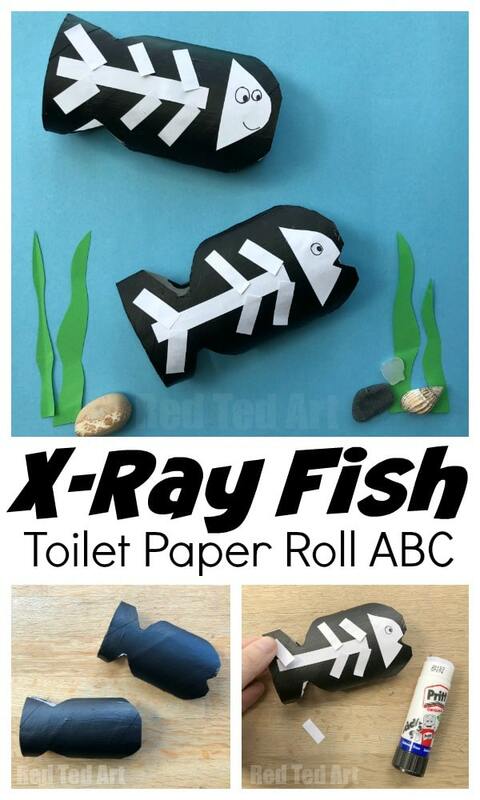 And yep.. that is how easy it is to make an Toilet Paper Roll X-ray fish for your Animal Alphabet!! 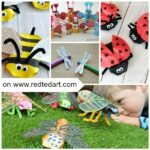 Do check the rest of the Animal Alphabet out.. as well as take a peak at our Handprint Animal Alphabet! 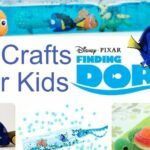 You will find that the X-ray fish in facts looks quite different to our craft – but for the purpose of exploring the letter X the craft is fine! The real x-ray fish has it’s name from it’s translucent skin. But isn’t in fact that see through. What do X-Ray Fish Eat? The x-ray fish is omnivorous – which means it eats both animals and plants (like humans!). Can you eat X-Ray Fish? No! They are poisonous!! Sorry.